Connecticut requires supervisors of food service establishments and non-retail food service establishments be certified in food protection. This means a person-in-charge, an owner, or manager of a food establishment – (i.e., restaurants, bars, cafes, bakeries, delis, mobile vending, food trucks, assisted-living, day care centers, and convenience stores) become certified by taking a approved food manager training course and successfully passing an accredited food manager certification exam. 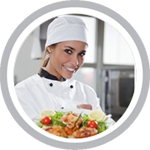 We offer online HACCP Training in Connecticut for: Bridgeport, New Haven, Stamford, Hartford, Waterbury, Norwalk, Danbury, New Britain, West Hartford, Meriden, Bristol, West Haven, Stratford, Milford, East Hartford, Middletown, Greenwich, Mystic, Newtown, Bethel, South Windsor, and many more!